Roberto Alterio is eager to get the season underway. 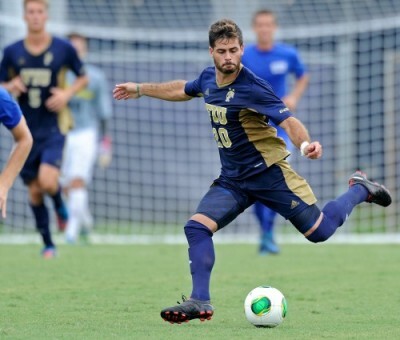 Alterio transferred from the University of South Florida to FIU as the Panthers’ new midfielder. Last year, he led the Bulls with five goals, and now he’s ready to score goals for his new team. He will have his chance when the season kicks off this weekend with a pair of road games in California, beginning Aug. 30 against Loyola Marymount in Los Angeles. The team will then head down to San Diego to take on San Diego State Sept. 1. The Panthers, under second-year head coach Kenny Arena, hope the Venezuelan midfielder could provide a big scoring boost to the team as they strive to compete for a Conference USA championship. FIU News: The season is just about ready to get underway. How are you feeling? Roberto Alterio: It’s really exciting because in the spring you’re just waiting for the season to start and being a new a new member on this team makes me really excited to start the year. FIU News: What are some of the challenges of starting the season with five straight road games? And what are some of the benefits? Alterio: We have a lot of away games this year so you have to manage your time well with classes and you have to be ready for that. The first few games are going to be good for us because we’re going to be playing against good teams. Road trips are cool because you get to know other places around the United States and you get to know your teammates and become tighter as a group. FIU News: You transferred to FIU after spending your first two years at the University of South Florida. What attracted you to come to FIU? Alterio: After I told my coach at USF that I wanted to leave, I had a number of options in San Diego and South Carolina, a team in Texas. But my final decision was made when I talked to [Coach Kenny Arena]. He told me we were going to have a good team and I’m getting a chance to see that now. We have a really good recruiting class coming in and that should help us this year. Miami is one of the biggest and best cities in the world and I have a lot of friends in the area so that really helped me a lot in making my decision. FIU News: What has your experience at FIU been like since you arrived on campus? Alterio: I got here on the first day of July and started taking summer classes. A week later, I started training with some of the guys on the team and got to see that they’re really cool guys. After the preseason, which went really well, we feel like we’re a really good team. FIU News: What are some of the strengths of this team that make you feel this team can be a success this season? Alterio: We have a lot of technical players, players who can run for 90 minutes and work hard. Those are the kinds of qualities that make for a good team and I think that’s why we’ll have a good season. FIU News: You spent some time playing with the Venezuelan U-17 and U-20 national team. How has that experience impacted your career? Alterio: Every player wants to play for their national team, it’s the best thing for a soccer player. Being around those kind of quality players helps you learn a lot and you gain a lot of experience and that helps you for the future and for your career in general. FIU News: What are some of the goals you’ve set for yourself personally and as a member of the team? Alterio: Team goals come first and we want to get into the Conference USA tournament and why not compete for a national championship? If the team does well, I think that’s going to help me and hopefully I’ll get a chance to get into the Major League Soccer SuperDraft at some point or go pro. FIU News: Where do you want to be five years from now? Alterio: I came here to United States because my mom wanted me to get my degree. That’s my top priority, getting my degree in sports management. After that, I see myself playing professional soccer – if not here, maybe in Europe or in a first division somewhere else.